How do I determine whether my computer and Internet connection meet the requirements for running and activating ReliaSoft desktop applications? Whether your computer meets the minimum system requirements for running the ReliaSoft desktop applications. Whether your Internet connection will allow you to connect with the ReliaSoft License Server (if applicable). To perform the test, first right-click this link (212 KB) and choose Save as to download the executable file ("RSTest.exe"). Then start the application and click the Run button. The first four items in the Requirements Test & Compatibility area determine whether your computer's processor, available physical memory (RAM), operating system and installed version of Microsoft Office meet the minimum requirements for running the ReliaSoft desktop applications. If a requirement is met, a green checkmark will show for that item, and details about your computer will appear. If a requirement is not met, a yellow circle will appear, and a description will indicate what changes are required. 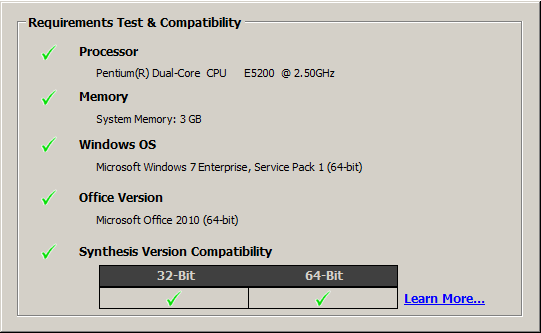 The table at the bottom of this area indicates which version(s) of the applications (32-bit and/or 64-bit) you can run on your computer. If your computer is capable of running both versions, click the Learn More link to read our 32-bit vs. 64-bit FAQ, which provides some information that may help you decide. The License Server Compatibility Test area determines whether your computer can effectively communicate with the ReliaSoft License Server. For some license types, this is required the first time you run the application so you can register and activate it for your computer. For Concurrent Network licenses (in Version 9) and some Floating Licenses, this is required every time you use the software. For each item in this area, a green checkmark or red X indicates whether or not the requirement is met. Note that the compatibility test will usually take longer to complete than the requirements test. If you are attempting to connect to the ReliaSoft License Server via a proxy server, this area will include a Details button that allows you to view the proxy's address and, if necessary, run additional tests. If you have any problems with registering or running your software, please contact technical support. Information is provided "as is" without warranty of any kind.